REMEMBER THE YEAR students dressed up the Demaray Hall clock face? Were you there when the Falcon baseball team took second in the NCAA regionals? Perhaps you attended the very first Seattle Pacific Homecoming — celebrated at Commencement? If so, you’d be close to 90 by now! Whether or not any of these memories are yours, you’re bound to have special reminiscences of your alma mater. The 2003 SPU Homecoming and Family Weekend, January 30–February 1, beckons you back to campus to “Light the Flame,” a tribute to the torch of faith and learning that has become the University’s symbol. This Homecoming, alumni, parents, students, faculty, staff and friends will converge at Seattle Pacific for three days of all things SPU: music, theatre, sports, talent and reunions. There are many opportunities at Homecoming for you to share in those experiences. At the Homecoming Chapel and Alumni of the Year Luncheon, you’ll hear the dynamic story of Myrna Axelson Anderson ’61 and Steve Anderson ’64. From career success to the establishment and teaching of Bible Study Fellowship groups in far-flung places, the Andersons have long been ambassadors for Christ. The Falcon Legends Hall of Fame Luncheon is your chance to celebrate the six charter member athletes of the SPU Hall of Fame. When you hear their list of achievements, you’ll be reminded of why Seattle Pacific athletes are so highly regarded around the country. The Homecoming theatre production builds on a legacy of fine performances that include “Shadowlands,” “The Elephant Man” and “Macbeth.” This year, the Theatre Department presents “The Last Night of Ballyhoo,” winner of a 1997 Tony Award for best play. A wealthy Jewish family readies its daughters for the social event of the season — “Ballyhoo” — and in the process, learns the strength of its own heritage as a second world war is beginning. Student talent also takes center stage at the Homecoming Talent Show in Brougham Pavilion. Whatever your favorite student acts — music, singing, dancing, comedy — they’re sure to be well-represented in this annual show of shows. Class reunions are the order of the day on Saturday with more than a dozen slated, including Founders and every fifth year between 1958 and 1998, inclusive. (The Class of 1953 will celebrate its 50th reunion in June.) Another anticipated gathering is the SPRINT “CORE” Reunion, an afternoon tailored to all the student administrative teams that have led the University’s national and international student mission efforts since 1980. At the 11:30 a.m. President’s Alumni Luncheon, Philip Eaton will share how The Campaign for Seattle Pacific University is working to fund SPU’s vision for “engaging the culture and changing the world.” Alumni awards and a special performance by the Alumni Choir combine to make this a popular event. 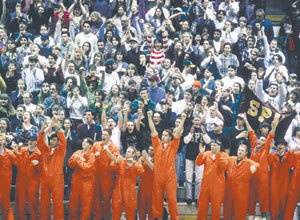 In the afternoon, Falcon basketball packs the house for some of the most spirited competition of the year. At 1:30 p.m., the No. 2-ranked Falcon women face off against the University of Alaska–Fairbanks Nanooks. At 3 p.m., the Falcon men swoop down on the Northwest Nazarene Crusaders. Half-time features the presentation of the Homecoming Court and the crowning of the Homecoming King and Queen. Guided tours of the new science building will be given continuously between 10 a.m. and 4 p.m. on Saturday. To be among the first to get an inside look at the new facilities, meet at the Bertona Street entrance to the Student Union Building. Homecoming brochures with complete schedule and ticket information were mailed in early January. You’ll find the same information online at www.spu.edu/homecoming. For more details, or to request a copy of the brochure, call 206/281-ALUM. "I'm the father of an AIDS orphan," says Tim Dearborn, dean of the chapel at SPU, as he recounts his teenage daughter's trip to Uganda. There she visited an AIDS orphan sponsored by the Dearborn family.